This feeder is simple elegance in elevated feeding. "The Bergan Elevated Feeder comes in three sizes and combines sleek form with function while helping to keep your pet healthy. 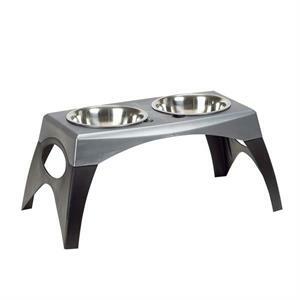 Removable legs allow the feeder to grow with your pet and removable stainless steel bowls make cleaning simple. This feeder offers a sturdy, clean design with (2) removable stainless steel bowls. Retail friendly single carton quantity. Why Elevated? Elevated feeders are commonly recommended by vets for dogs who have joint problems, gastric issues, or who are just having trouble getting down to their food. Large 24" x 13" x 11.10"
Extra Large 27.72"x 15"x 15"